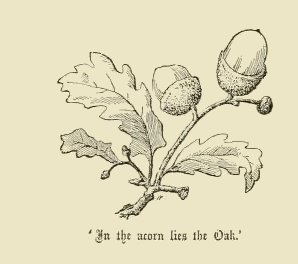 Vintage drawing of a small oak tree branch with leaves and acorns. The original drawing included the caption, “In the acorn lies the Oak.” It serves to remind us all that from little things can grow the stuff of dreams and to never stop dreaming. This is a number of drawings from William Walker (b. 1821) that he included in his Handbook of Drawing published in 1880.